Super Duper Gamer Team Entertainment: HyperX Cloud Stinger... reviewed! HyperX Cloud Stinger is easily one of the more popular headsets in the $50 range... and there is a reason why; it's an awesome headset! When this package arrived at the office... all I could think is “It's go time!”. So I grabbed the scissors... after multiple attempts to slice the tape with a pen. Opening this bad boy up... I knew what to expect (like duh) but, it was still exciting because I'm a bit of an audiophile. You can find me sleeping with headphones on... often. Which is why my avatar has them. Anyway, even though these headphones are presented on the lower end of the price scale... they are presented in packaging that's surprisingly better than others I've come across in this range. Granted some companies want their headphones seen through the packaging at retail stores (or being creative with the cheaper packaging), it just doesn't feel like a higher quality presentation (to me). So I was pleasantly surprised. These headphones were made with quality in mind... while also keeping them in the realm of affordability as far as the average Joe is concerned. There are nice touches to these headphones like the adjustable steel slider... that didn't have to be added, but they went the extra mile. This adds to the quality of the product... which doesn't feel flimsy. In addition, this headset is lightweight... and doesn't feel like I'm lugging something around on my head. The 90-degree rotating ear cups are also a plus for me... because if headphones are not on my ears, they're on my neck or close by. It allows me to place one cup on my ear if they're around my neck or allows for full movement of my head when both cups are laying flat on my shoulders... which doesn't seem like a big deal, but (again) these are being reviewed by someone that uses headphones nearly every single day. When it boils down to it, when I want to multitask or get the headphones off my ears... when I'm not home or in between online matches, this comes in handy. I don't want to feel like my head is trapped in between ear cups pressing against my cheeks. The earcups are comfortable also. When wearing them on my head... I have been able to keep them on for hours without needing a break, and they aren't pressing against my ears... they fit fully around them. That's a plus for me because my ears are sensitive and don't feel too well if something is pressing against them for a long period of time; if you have your ears pierced up top... this is a plus). This sensitivity with my ears has caused me to cycle through multiple headphone types in search of comfort that allows me to enjoy my love of quality audio. If the comfort isn't there... I really don't care how good they sound (although its a sad day whenever that happens) because I need a combination of comfort and quality audio to help up the enjoyment of my experience. FYI: Noise cancellation is pretty good too. 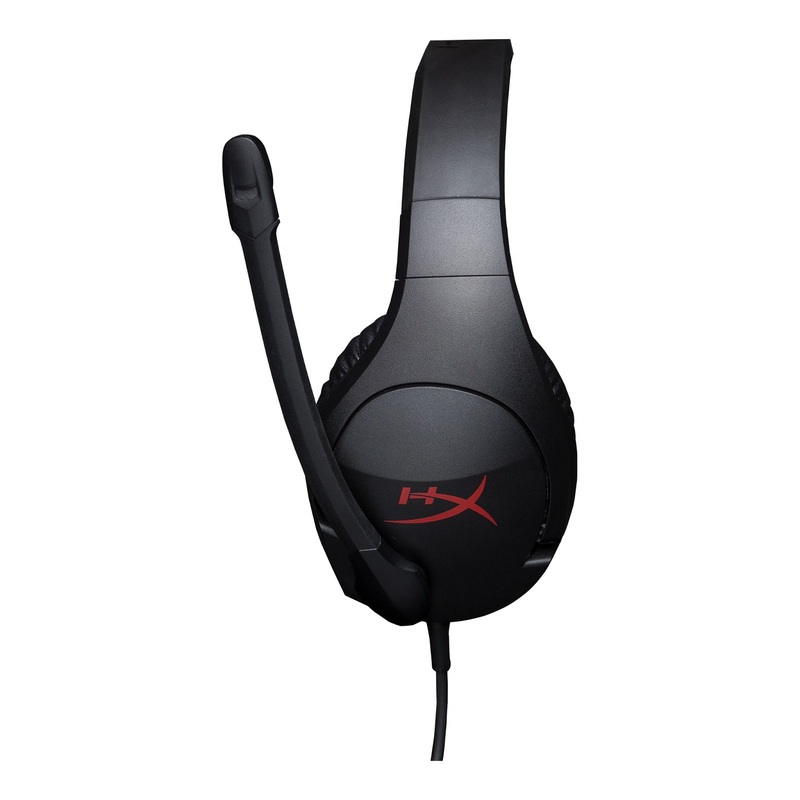 The HyperX Cloud Stinger headset has simple controls... that get the job done. I have another headset with various controls on the cord, but it feels like an anchor at times. While this headset on the other hand... has a volume slider under the right ear cup... and a mic on the left earcup that you merely swivel down to turn on and up to turn off. That's all there is to it, and... that's fine by me... especially with what I am seeking when gaming on the go. Members of HyperX know that my alternate headset has a USB connector, it's cool... but heavier and remains in the office because I can't connect it to multiple devices. This headset on the other hand... gives me multi-platform compatibility, and this versatility puts a smile on my face because you know what time it is from that point. The HyperX Cloud Stinger has 50mm direction drivers... which have given me excellent sound playback in games like Nex Machina (which I've been playing the crap out of), movies and music. The music surprised me... the headphones deliver some nice bass and the sounds of the instruments consumed me for the duration of the tracks I listened too. I mention these non-gaming related options... because I get my worth out of headphones to a serious degree. Gaming is obviously a major factor also, and this headset gives you the option to go from PC gaming, to console gaming to mobile... and back again. As far as the mic is concerned, the recording is pretty clear... but I'm going to go ahead and use this to usher in the cons for an even better version. The headphones are great, but when the mic is swiveled up... I get concerned about it being hit and going back too far, ending in a damaged mic. If it were me, I would've added something on the side to block it from going back to the point of no return. When it comes to the cons... that's the only one I have with these headphones, so feel free to rejoice now. 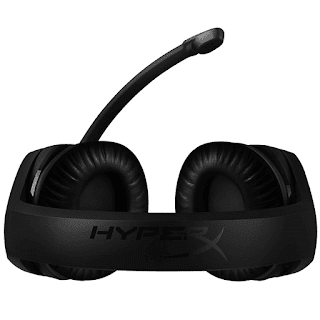 This isn't a con... but I believe that if HyperX had another set of these Cloud Stingers that had a detachable cord and mic... for maybe $15 more, those would likely be the more popular version (it decreases the concern of a damaged headset in the event of snagging). Overall, this is a great gaming headset, especially if you want to get an affordable pair that doesn't feel... cheap. I recommend the HyperX Cloud Stinger for online multi-players, multi-platform gaming, gamers that present commentary & eSports team action. 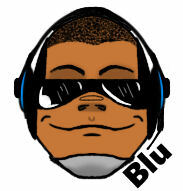 Discord & TeamSpeak are just a number of compatible programs that will work with this headset... so you're good to go. What's also included in the box is an extension cable that has separate 3.5mm headphone and mic jack plugs. 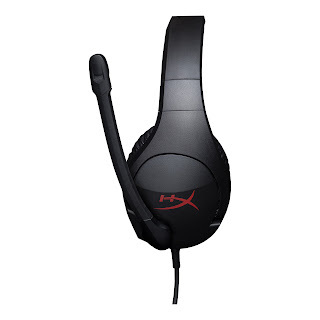 I rate the HyperX Cloud Stinger headset a 4.8 out of 5. You can get the HyperX Cloud Stinger headset... for $49.99, and for what it's worth... if you were looking for a nicely priced headset for gaming, etc. might as well get something with some oomph (that's realistically portable). That said... thanks for checking out this product review, game on! Brought to you by... HyperX!